Update: With the referendum complete, the Republic of Crimea has addressed the United Nations seeking recognition as a sovereign state and called on Russia to integrate it into the Russian Federation. However, a spokesperson for UN secretary-general Ban Ki-moon told reporters the Crimea secession referendum will only exacerbate an “already complex and tense situation” and that the secretary-general is “deeply concerned and disappointed”. The UN position, as enunciated by Ki-moon, is for all parties to work for a solution that is guided by the principles of the United Nations Charter, “including respecting Ukraine’s unity and sovereignty”. This is uncalled for and a display of partisanship that is not in accordance with the UN Charter in the first place, not for an inter-governmental body that has written “democracy” and “democratic principles” into more resolutions, statements and declarations that one can count. The Crimea referendum was held in the presence of international observers, including those from the Organisation for Security and Cooperation in Europe. The respect for sovereignty that Ki-moon expects for Ukraine, is equally to be expected for the Crimean population, and indeed for the populations of Somalia, Haiti, Sudan, Serbia, Afghanistan, Pakistan, Iraq, Yemen, Libya and Syria. With these statements by Ki-moon, the role of the UN as a stabilising factor in international disputes comes into question. The embargos and restrictions and bans (collectively and incorrectly called ‘sanctions’ by the USA) against Russia are already coming into effect, despite advice from Mikhail Gorbachev, former leader of the Soviet Union, that they should be discarded. 15 Mar: In the first place, this is a referendum to be undertaken (on Sunday, 16 March 2014) in Crimea, which is in Ukraine, and involves residents of Crimea, not the residents of ‘western’ nations (or allies) – as the ruling regimes in the ‘western nations’ have taken to labelling themselves – and not residents of Russia. The United Nations Security Council, a lame-duck body that has been used numerous times in the last 40 years to issue a rubber-stamp for the imposition of punitive embargoes (called ‘sanctions’ in American English) and for the waging of ‘just’ war (or wars of ‘liberation’, wars of ‘peace-building’ and wars to uphold ‘democracy’), has just voted on a resolution that calls the Crimean referendum illegal. Russia vetoed this resolution (China abstained) and the ‘western allies’ voted for it. That the UN Security Council met to even consider such a resolution is testament to its nakedly partisan nature – serve the interests of the USA and its EU allies. The UNSC has no business to decide whether or not a referendum held in a region (province, republic, autonomous or otherwise) of any country is legal or not. A poll run by the Ria Novosti news service on its website shows the support – 72.8% in favour against 12.8% not in favour – for Crimea joining Russia. A referendum is neither a threat to peace nor aggression, and there is no dispute involved that falls within the ambit of what the UNSC describes as dispute. The UNSC therefore, under the UN Charter, has no locus standi on a matter such as this. So said Samantha Powers, the representative of the USA to the UN. Her words of staggering hypocrisy are exceeded only by the even more shameless hypocrisy of the US Secretary of State John Kerry on the matter, and by those of the president of the USA Barack Obama on the matter. America’s warmongering record since the end of World War Two stands as bloody counterpoint to the hypocritical disinformation being vomited out by the US government and being faithfully broadcast by pliant media. The puppet government installed in Kiev, the capital of Ukraine, as a result of the regime change engineered by the USA and Germany, and several more ‘western’ allies, also voted in its ‘Verkhovna Rada’ (parliament) for early dissolution of Crimean parliament (as reported by Itar-Tass). 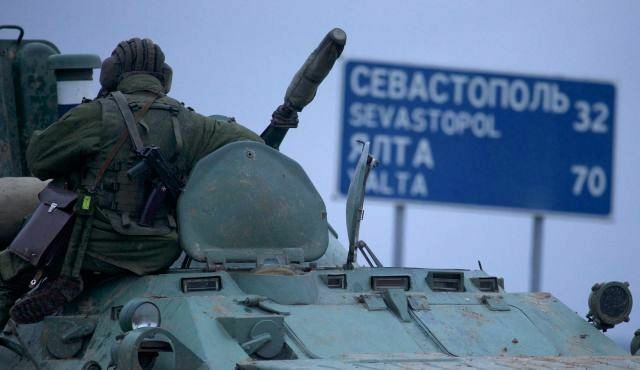 The coup-imposed government has cut off financial links to Crimea, but has pledged not to attack the peninsula militarily. Even while Samantha Powers was arranging hypocrisy in great putrid piles around a US-drafted resolution that is nothing but crude sabre-rattling, NATO began air drills with fighter jets in Poland (which borders Ukraine). Recently dispatched US jets took part in the exercises, with more lies from Washington’s military hawks claiming that the drills were planned before the unrest in Ukraine. John Kerry has already denounced the scheduled referendum in Crimea on secession from Ukraine and reintegration into Russia as a “backdoor annexation” which proves nothing more than his limited but vicious vocabulary. Following the script of this phoney attempt at intervention through the UN Security Council – which also serves, in the twisted logic of the US-EU combine that fostered the Kiev coup and which is just as keen to foment a new conflict on Ukraine’s borders – it is not difficult to see the close-range reactions. The coup-installed government in Kiev will reject the results of the referendum and accuse Russia of violating international law by using its military might to ‘redraw Europe’s borders’ – with the ‘western nations’ ignoring their gory histories of redrawing borders in Africa, Asia and South America. The government of Russia will angrily remind the world that these Ukrainian ‘authorities’ came to power as a result of a coup planned and carried out by pro-Western and anti-Russian extremists, inspired by the US and EU, and that ethnic Russians in Ukraine are now facing discrimination and worse. NATO may even revive its old favourite scheme to install US missile defence systems in Central Europe (the old story was that these would protect NATO allies against ‘rogue states’ like Iran). ‘Sanctions’ will follow, a variant of the Cold War will once again settle over Europe. But the finance and economics of this confrontation will change. The US and EU are intent on having some semblance of what they call a state in Ukraine in which to funnel billions of dollars and euros – that this economy even before the engineered coup was ramshackle and corrupt (run by oligarchs, now replaced by other oligarchs) does not seem to be a consideration. The pliant media assisted by faithful think-tanks who march to the drumbeat of the US State Department will paint this movement of speculative capital as being necessary to create a prosperous and democratic society. There will be no reference made to Yugoslavia, where the same set of tactics was used, and which didn’t work. There are other differences. 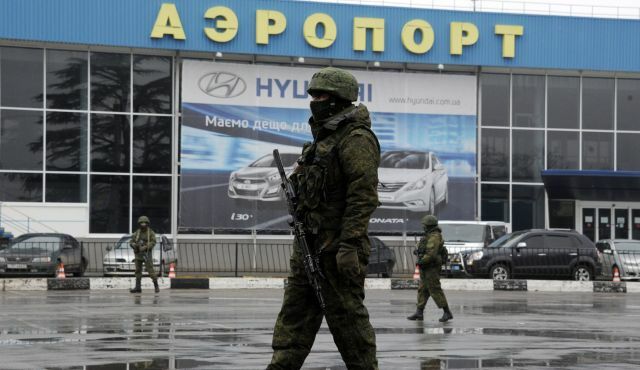 The opposition in Crimea to the USA-backed and fascist-led putsch of 22 February 2014 in Kiev has infuriated the US government in Washington and its EU ‘western’ allies. In Ukraine, the coup-installed government takes its orders from the International Monetary Fund and from Wall Street bankers (the source of or gatekeepers of the said billions) and is preparing a programme of savage austerity measures against the working class – of the same kind that has ruined labour in Greece, Italy, Portugal and Spain (which has also ruined labour in the ‘western allies’ but that ruination has been hidden better). These foul machinations will be obscured by a typhoon of propaganda. Already incendiary proposals are circulating in the American and the global financial media. In an article titled ‘How to Put Military Pressure on Russia’, the Wall Street Journal (the house organ of the Davos parasites) has called for arming Polish Air Force F-16 fighters with nuclear weapons (!) and stationing detachments of US ground troops in Poland, Romania and the Baltic countries. This has been backed by thuggish statements from Kerry, who said this week that if the Crimean vote takes place “there will be a very serious series of steps on Monday in Europe” and that sanctions against Russia would “get ugly fast”. 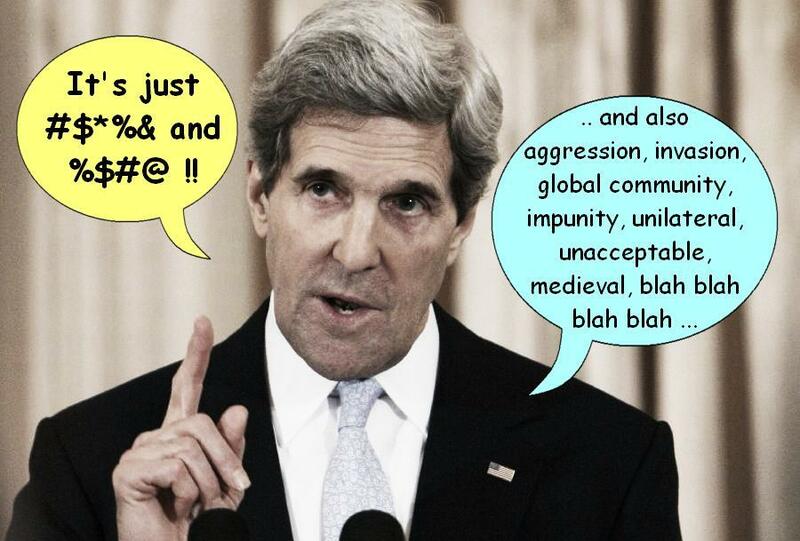 Al Capone would have welcomed Kerry’s brand of diplomacy. Not far behind however are German chancellor Angela Merkel and Britain’s prime minister David Cameron. Also this week, Merkel said that planned EU sanctions are meant to cause “massive political and economic harm” to Russia, while Cameron promised, as any schoolyard bully does, that if we don’t “see Ukrainians and Russians talking to each other” (about what the USA and EU want, not about what the Ukrainians, Russians and Crimeans want) “then there are going to have to be consequences”. The blatantly provocative and dangerously violent nature and tone of the pronouncements made by these heads of government and senior functionaries is to my mind in need of United Nations attention. Instead, UN secretary-general Ban Ki-moon told reporters in New York that the situation in Ukraine continues to deteriorate and there was “a great risk of dangerous, downward spiral”. He urged Russia and Ukraine not to take “hasty measures” that “may impact the sovereignty, unity and territorial integrity of Ukraine”. Not a word by the UN sec-gen about the atrocious and dangerous misconduct by the heads of government of the ‘western nations’, by John Kerry, Barack Obama and Samantha Powers on this matter. So much for the ‘United’ part of the UN.